Proverbs 3:5-8 – Trust in the Lord with all your heart; do not depend on your own understanding. Seek his will in all you do, and he will direct your paths. Don’t be impressed with our own wisdom. Instead, fear the Lord and turn your back on evil. Then you will gain renewed health and vitality. “When I was growing up, people always told me to trust God. I never really understood why or how. I mean, nobody can see God. So I wondered, What problems can God solve? . . . The biggest problem I had at the time: I would be moving soon and would never see any of my friends again. “. . . When I talked to my parents about my feelings, they told me to trust in God. I made a promise to myself that I would try my best to keep an open mind and see what God had in store. “. . . I sat down next to another student anyway. Over the course of that year, we became great friends and we’re still close friends today. 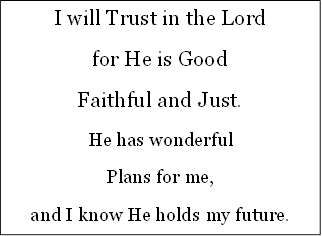 THOUGHT FOR THE DAY – Today I will keep an open mind to see what God has in store for me. Prayer: Dear Lord, thank you for supporting us when life presents challenges. Help us to trust you day by day. Amen. This entry was posted in Comfort, Encouragement, Guidance, Hope, Inspiration, Love, Peace and tagged Abilities, Answers, Application, Apply, Assume, Assumptions, Assurance, Bible, Bitterness, Character, Children, Complaining, Concern, Concerns, Consequences, Criticism, Decisions, Depend, Dependence, Desire, Desires, Destruction, Doubt, Evil, Faith, Forget, Forgetting, Freedom, Future, Gifts, Grace, Guilt, Hatred, Honesty, Hopelessness, Hypocrisy, Hypocrites, Inspiration, Intentions, Laws, Lifestyle, Limitations, Limited, Lost, Love, Marriage, Negatives, Obey, Patience, Perfect, Perfection, Perseverance, Perspective, Pleasure, Problems, Reason, Rebellion, Respond, Scriptures, Secure, Security, Seeing, Seek, Selfishness, Sin, Spiritual gifts, Stubbornness, Success, Temptation, Training, Trust, Unify, Unity, Usefulness, Willingness, Wisdom. Bookmark the permalink.